I had porcelain veneers placed almost two years ago. I’ve been happy with them, but recently have noticed staining between my teeth. I do smoke, but I was pretty sure these were supposed to be pretty resistant to change. Is something going bad on them? You are correct that porcelain veneers are quite stain resistant. I wish I had a picture of your particular case. It would help to make a more certain suggestion. Often, when people are talking about stains on their porcelain veneers, it is because their hygienist used some type of power prophy jet, which takes the glaze off. 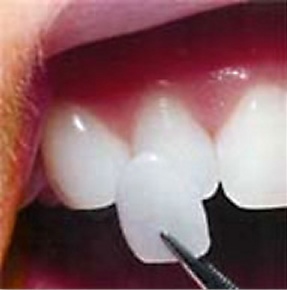 When that happens, the staining ends up covering the entire veneer However, you said it is just between the teeth. I can think of two possibilities for that. The first possibility is the porcelain veneers aren’t flush with your teeth in the edges there. That will be tricky to fix. If that ends up being your issue, I’d seek an AACD accredited dentist (not just a member) to do the work. The second possibility is that there is some composite bonding there which needs polishing up. Your dentist may even have recommended this as part of your regular maintenance. Most do. With you being a smoker, it will be even more important. However, go back to the dentist who did you porcelain veneers, don’t expect your family dentist to know how to do this. In addition to periodically having the polishing done for their longevity, it’s helpful if you use a toothpaste which is specifically designed for cosmetic work. Supersmile is the one most cosmetic dentists recommend. If you like using a mouthwash, you don’t need to get anything special. Just be certain you don’t use one which contains alcohol. That will eat away at the bonding that holds them onto your teeth.